I have decided that every Wednesday evening I shall take time to do work on some beading. I did last night and realized that I was WAY out of practice. I also need to take a few more chances and grow as a beader, too. Still, I made two simple pieces. 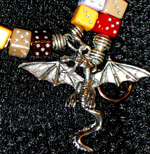 The first is what I call the Dungeons & Dragons necklace, as it uses acrylic dice beads and a pewter dragon pendant. As a note, I am a BIG D&D nerd. I saw the beads on Fire Mountain Gem’s site and had to get them. They are cute! And nerdy! And I have more of them left, so I can use them in another project. The second piece I made was a pair of earrings using glass beads. Eh, they turned out ok. I need to get better at making loops again. I need to restart somewhere, I guess. They aren’t that bad, I suppose. I’ll wear them to work one of these days. Point being, I want to get back into beading like I was a few years ago. I have plenty of supplies, so there is no excuse in that area. I also have a friend who does beautiful wire beading work, and her enthusiasm has encouraged me to get back into beads. 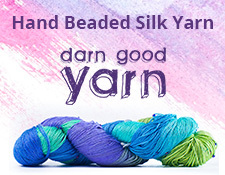 In fact, we are going to make it a point to work on our beading projects every Wednesday night we can together, too. A friend’s support can be a great boon! In other news, I am amidst the great deluge of rain in Pennsylvania right now. It’s times like this I am glad I do not have a basement and that I live on a hill. It’s a good day to do some chores and to craft, since all the roads are flooded and work was closed today on account of that.